Content Marketing has come a long way since its days as a buzzword. The practice has been embraced by big-name brands, innovative startups, and a few unexpected players. Beyonce’s self-titled album and complementary set of music videos is an example, and even the White House got in the game with its candid photo galleries. For more best in class examples, check out Kapost’s roundup of the top 50 content marketing brands. At Visually, we’ve discovered a thing or two (or three) about best practices when it comes to creating compelling content. 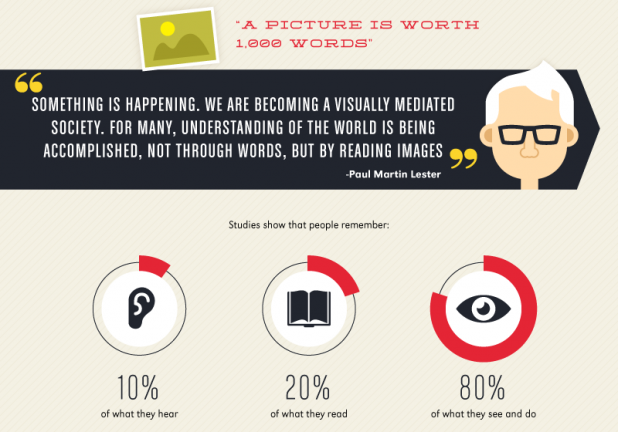 Time and time again, visual content outperforms others in terms of grabbing attention, persuading consumers, and telling a story. The data doesn’t lie – people recall 80% of what they see and do compared to just 20% of what they read and 10% of what they hear, according to research by Paul Martin Lester of Cal State Fullerton. Hemingway is famous for writing a 6 word novel – “For Sale: Baby shoes. Never worn” – perhaps the world’s first example of micro-content. Modern micro-content, which is created and optimized for today’s social media platforms, is made to be instantly sharable. However, text-based micro-content like tweets or Hemingway’s ‘novel’ can only go so far. Pairing a bite-sized piece of content with visuals can take micro-content to the next level. Gary Vaynerchuck is betting big on the future of micro-content. His VaynerMedia and GrapeStory agencies center their business around micro-content, and the recently launched Burst followed suit. GrapeStory has built successful campaigns for Virgin Mobile USA, Aquafina, and GE, and it’s only a matter of time before other brands follow Vaynerchuck’s lead. When native advertising solutions first appeared on the scene, publishers like The Atlantic failed to strike a balance between sponsored content and taking advantage of consumers, as John Oliver has famously noted. In 2014, however, publishers such as The Onion and Gawker have built best-in-class solutions that have the marketing world abuzz. Oreo’s dunk in the dark tweet set the standard for real time marketing success during the Super Bowl in 2013, and marketers have heavily invested in real time content strategies over the past year. While swat teams of strategists, social media experts, and brand managers huddled in a room can help brands take advantage of big time events, only the best can walk the fine line between ‘eventjacking’ and truly driving lifts. As consumers spend more time with their mobile devices, advertisers are shifting their strategies to reflect this trend. In addition to creating mobile-first strategies, some more aggressive brands are taking mobile-only positions. Taco Bell’s recent app-only strategy included going dark on Facebook and Twitter to encourage consumers to download their new mobile app. The term ‘Big Data’ has been quoted and repeated ad nausuem, and it’s as important as ever. But having plenty of data is only half the battle – utilizing this data to derive insight, draw conclusions, and influence strategies is important for companies in every industry. While advertisers use data to inform various strategy decisions, publishers can utilize data to ensure their ad serving strategy reaches consumers who matter most. Vivaki’s new Audience on Demand platform optimizes native advertising buying in real time to help their partners maximize success. Beacons were utilized for the first time in 2014 and showed huge amounts of upside. Companies such as Signal360 and Swirl offer powerful platforms to take advantage of smart phones’ ample location-based data. Signal360 has partnered with big-time sports teams including University of Michigan Football and the NBA’s Golden State Warriors to enhance the live sports experience. Augmented reality ads combine the best in interactive ad technology, micro-content, and personalization. Ikea turned its traditional home furnishing catalog into an addictive video game-like experience for its 2014 edition. The catalog was paired with a smartphone app that allows consumers to see exactly how a piece of furniture would look in their home with the help of augmented reality. 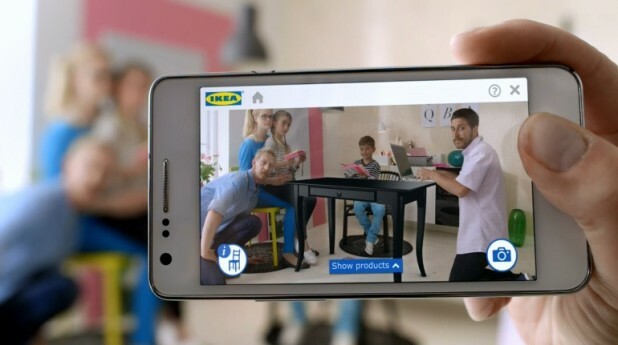 The Ikea catalog app allows users to see exactly how furniture will look in their home. Content Marketing can be complicated. Organizing, managing, and analyzing hundreds of pieces of content per week across multiple different mediums can get tricky, but a number of software solutions can ease this pain. Platforms like Percolate, NewsCred, and Marketo take the guesswork out of content marketing and centralize all aspects of a digital marketing strategy in one place. Display ads can only work so hard. Estimates put the banner click rate for online banners at less that .1%, but innovative formats can help better engage an audience. As consumers tire of standard flash and display ads, custom ad units and interactive formats help communicate information in more engaging ways. Consider applying the lessons learned from other forms of native advertising and make sure your content both stands out and adds value. Online ads should be an extension of your overall content marketing strategy, perhaps supplying an important or surprising piece of the story you are trying to tell. It’s no secret that playing to consumers’ vanity is a best practice in B2C marketing. Consumers like to be flattered, and if your brand can make consumers break a smile, this can go a long way to establishing long-term loyalty. Coke’s “Share a Coke” campaign did just this and helped right the ship after 11 straight years of soft-drink volume declines. Marketers are investing more in video marketing than ever, and platforms like Vine and Instagram make it easy to create micro-content videos. With 4 out of ever 5 companies producing multiple online videos per month, video content marketing is here to stay. And as with all other aspects of content marketing, measurement is a must. Tools like Visually’s Native Analytics help reveal who is watching your video, where it’s being shared across the web, and how consumers are truly interacting with the content.